In 1915 – at the beginning of World War I – Hugo Ball (writer and theatre director) came with his female partner Emmy Hennings (dancer and chanteuse) from Munich to Zurich. 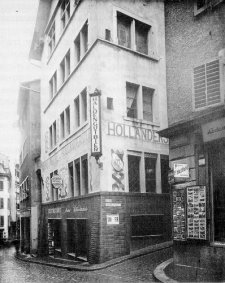 On Saturday February 3, 1916 was the inauguration of the Cabaret or ‘artist-tavern’ Voltaire located at Spiegelgasse 1 in Zurich. Hugo Ball made an agreement with the owner of the tavern ‘Meierei’ to use the backroom for a literary cabaret and to increase the sale of beer, sausages and sandwiches. An evening with music, dance, manifestos, theory, poems, pictures, masks and costumes presented by Hugo Ball, Emmy Hennings, Marcel Janco, Tristan Tzara, Georges Janco and Hans Arp. The placard for this event was made the ukrainian painter Marcel Slodki. Despite of World War I, the atmosphere in Zurich was very liberal. In the same narrow alley, Spiegelgasse 14, where the Cabarat Voltaire played, lived a certain Mister Uljanow aka Lenin. 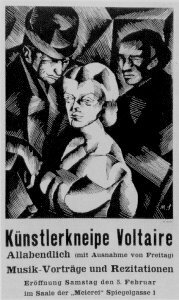 The only edition of the magazine Cabaret Voltaire was published on June 15, 1916. 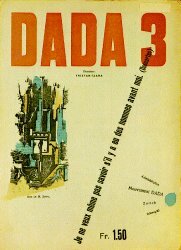 It was initiated by Hugo Ball and contained, amongst contributions from Kandinsky, Arp, Modigliani and others, the first print of the word Dada! In addition to the literary character of Cabaret Voltaire the Zurich Dadaism attented in a second phase to the pictorial art. At the Bahnhofstrasse 19, they exhibited works from Kandinsky, Klee, Arp, de Chirico, Feininger, Ernst, Janco, Modigliani, Macke, Kokoschka and others. From July 1917 to May 1919 four magazines were published. The third number contained, in addition to contributions by members of the Berlin ‘Club Dada‘, articles by Francis Picabia. On the publication ‘DADA 4-5’ worked further members of the Paris group. The 8th ‘Dada-Soirée’ was at the ‘Kaufleuten Saal’ on April 9, 1919. During a reading of Walter Serner the audience began with interjections and finally some of them attacked the stage. The whole auditorium was in commotion and Dada-Zurich ended in tumult and chaos as it began. 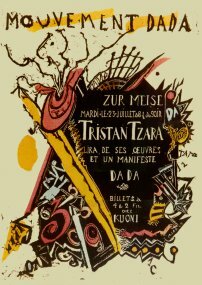 > Tristan Tzara wrote 1922 a chronicle about Zürich-Dada.